Regardless of its size, any type of plastic contamination found in a finished food product can become a public relations nightmare for both the brand and the food manufacturer. After all, just a small piece of plastic contamination can result in a recall and potential lawsuits. For those that keep track of food recalls, “plastic contamination” is an all-too-familiar phrase. From cake to tuna to dog food, the discovery of plastic contaminants is a familiar and troubling event for both the customer and the producer. Ensuring effective measures to prevent contamination of food products is a major concern for food manufacturers. Not only do contamination accidents require production line stoppages and incur huge costs, they also involve vast amounts of time and money to regain consumer trust and rebuild a shattered brand image. Since ordinary plastics cannot be detected by metal detectors or x-ray machines, finding a solution to plastic contamination issues has been a longtime challenge. However, today there is a solution. By incorporating new additives during manufacturing, broken pieces or fragments of plastic materials mixed in with food products can be detected by a metal detector or x-ray inspection system, enabling manufacturers to prevent contaminated products from reaching the market. This white paper explores how detectable additives are helping food processors detect and reject unwanted elements before the final product reaches consumers to preserve product safety and quality while reducing the risk of unwanted media attention and legal snafus. Food safety vigilance and increasingly stringent government guidelines continue to drive the importance of keeping foreign material out of food and food ingredients. More often than not, the threat to food safety comes when some unwanted element—a fragment of metal, piece of rubber, plastic or grain husk—enters a food ingredient or its package. Pen caps, pens, gloves, band-aids, etc. are prospective contaminants that can show up in a finished product, acting as choking hazards, laceration hazards, biological hazards, and as a shock to those consuming the product or to those serving it. The U.S. Food and Drug Administration (FDA) considers hard objects equal to or greater than .28" (7 mm) in length as potential choking hazards. Foodservice safety guidelines are affecting not only how food is prepared, but the types of products used in food manufacturing. For example, major restaurant chains insist that food processors now use plastic and rubber articles that are metal and x-ray detectable. This has become part of many company's HACCP (Hazard Analysis Critical Control Point) programs. Metal detectors and x-ray systems have long been used to detect metal and non-metal contamination in food processing operations. The trend today is the continued improvement in the detectability of supplies and equipment—including those made of plastic or rubber. Detectable additives can be infused during manufacturing to slightly magnetize some of the plastics so they can be separated by magnetic separators or detected by metal detectors or x-ray systems. This technology significantly augments the safety culture in a foodservice operation by adding detectability to items that are not naturally detectable or separable. Parts or pieces that can potentially contaminate food products can be detected, located and isolated using standard metal detectors or x-ray systems. The use of metal and x-ray detectable plastics in food processing and packaging operations is rapidly spreading to other industries where product purity is also a concern. Cable ties and tie mounts, labels, shovels, ear plugs, pens, measuring cups, wear strips, guide rails on processing equipment, and general processing and packaging equipment machinery parts, are just a few of the products now available in metal/x-ray detectable plastic materials. Food manufacturers rely on a variety of tools and equipment to assist in production and packaging. The list includes gaskets, seals, o-rings, scrapers, gloves, scoops, shovels, spatulas, totes, returnable containers, pallets, warning tags, buckets and more. Gaining momentum are new resin additives that impart metal detectability, x-ray contrast and magnetic susceptibility into plastic moldings to protect consumers from plastic contaminated food products. Molders, suppliers and distributors of foodservice equipment are offering detectable versions of existing products—or introducing new lines—because food manufacturers are demanding it. 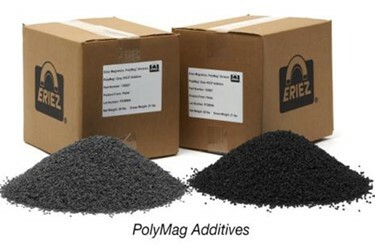 The Eriez® PolyMag® Additive Process renders the plastic resin magnetically susceptible with an additive (high-concentration pellets) in a process similar to adding color concentrate. All resins, including thermosets and thermoplastics, are candidates for metal/x-ray detectable additives. To make plastic and rubber articles detectable, the first step is to blend the additive into the resin. By including the additive during compounding or molded part manufacturing, plastic and rubber products can be detected using standard metal detectors and x-ray inspection systems. The additives are available in a dry, free flowing pellet, with a variety of polymer carriers that are compatible with a wide range of resins, or in powder form for compounding. Resins containing the PolyMag Gray HSCP can be pigmented darker colors like blue, gray, green, red and purple. The lower cost PolyMag Black HSCP is suitable for black applications. PolyMag Beige XRD is preferred for applications that require a high level of x-ray contrast. To verify the safety of the PolyMag Additives for food contact, Eriez had the FDA review PolyMag Additive ingredients for FDA compliance in both single and repeat use food contact plastics and rubber applications. In a letter of opinion issued by the FDA, the agency stated that all PolyMag Additive compounds are regulated for this intended use. How detectable is the material? Typically, the PolyMag Additive is included at ten to 20 percent loadings by the molder. Tests in 1/8” plastic cubes with a 10 percent PolyMag loading produces detectability similar to a 1 mm mild steel sphere as tested on a metal detector in wet or conductive products. Keep in mind that it is much easier to locate detectable plastic in wet or conductive food products. Detection in dry foods like flour is more difficult because the phase angle of the dry food and the detectable plastic is nearly the same. Oils, margarine, dry spices and frozen foods also have phase angles similar to detectable plastics. To isolate detectable plastics in these food products, the plastic piece must have a longer signal than the food product so a larger piece of plastic with a higher metal loading is required. The notion of a physical hazard potential is typically where many food manufacturers initiate standard operating procedures (SOP) to reduce this risk. When a contaminant is discovered, there are many questions to answer. What is it? Where did it come from? When did this happen? How much product is potentially contaminated? As part of a thorough investigation, determining the source of the contamination is the key to initiating swift and effective corrective and preventive actions. Food manufacturers that purchase and use metal/x-ray detectable products can readily identify plastic contamination and work quickly to reduce impact on consumers and their brand. Resin additives, such as the Eriez PolyMag Additives, are a growing part of the plastic manufacturing process and should be a part of any SOP when it comes to food manufacturing. Food products inadvertently containing plastic fragments, which can be scanned by a metal detector or x-ray machine, can quickly be taken out of the stream before reaching the marketplace, thus ensuring product safety and purity.